It's a long way between tigers' native habitat in the lush forests of southern Asia and the sun-baked desert of Nevada - but sadly for four cubs born at a Las Vegas casino, they will only ever know the latter. Earlier this week, Siegfried and Roy held an event to introduce these latest feline attractions at The Mirage Hotel & Casino. 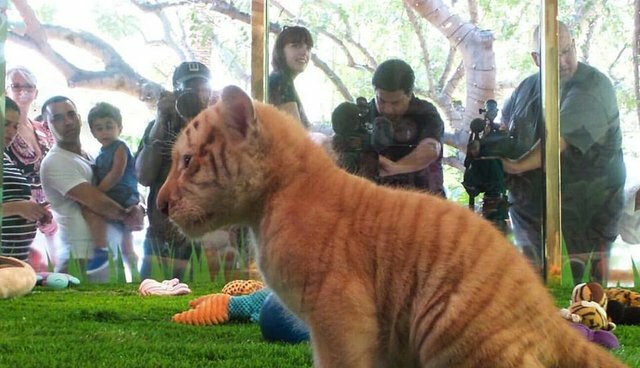 Crowds of tourists and TV crews clamored for a peek at the adorable youngsters whose fates have been condemned to that of living attractions, a far cry from what a tiger's life is typically like. It's weigh-in Wednesday! Justice is still ahead of us but we'll catch up soon. In fact, it was only three weeks after their birth that they were weaned away from their mother, who is also captive at the casino. 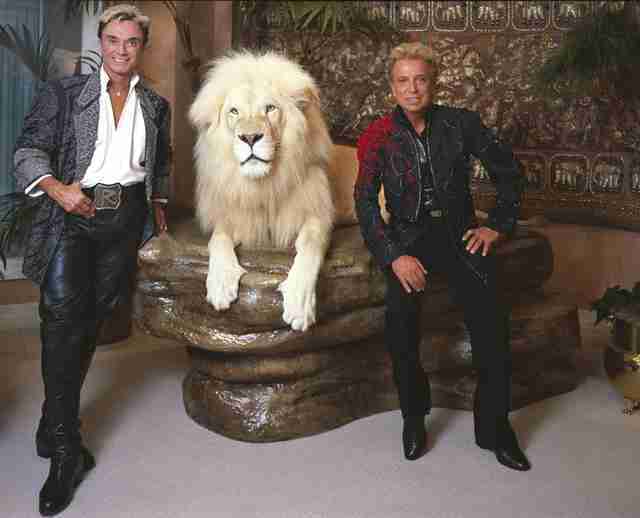 "The cats are being raised by their human family to create that special bond between man and animal that Siegfried and Roy are known for," the Mirage said in a statement. A spokesperson from the casino confirmed to The Dodo that the four cubs will spend their lives on display there. For more than a decade, the magicians ran a stage show at the Mirage famously featuring a variety of big cats. Their regular run came to an abrupt end in 2003, however, after Roy was reportedly bitten in the neck and seriously injured by a male white tiger they'd forced to perform. Since then, the pair continue to be a presence at the Mirage, lending their name to an exotic animal attraction, Siegfried & Roy's Secret Garden and Dolphin Habitat - home to numerous big cats, as well as a miserable pool that has claimed the lives of 22 marine mammals. That said, despite the wholly unnatural existence that awaits these four tiger cubs, set alongside the gaudy spectacles of the Las Vegas strip, it's all for a good cause, supposedly. "Our newest 'Ambassadors of Conservation' play an important role in our never-ending quest to protect these animals," Roy said, according to a press release. "It is imperative to continue our conservation efforts to save these magnificent tigers for future generations to enjoy and cherish." "It is always exciting to welcome new members to our family at The Mirage," added Siegfried. It's unclear how keeping tiger cubs at a casino might bolster their conservation in the wild, but The Mirage is quick to point out an association with Siegfried and Roy's nonprofit SARMOTI Foundation - the aim of which is "to protect, conserve and preserve endangered and threatened animals globally, with particular focus on the big cats: tigers, lions, cheetahs, panthers and leopards." The Dodo reached out for more information on how SARMOTI is contributing toward big cat conservation, but our requests for comment were not immediately returned. According to a 2014 disclosure to the IRS, however, the SARMOTI Foundation made $97,413 in contributions to various charities and organizations that year, only a portion of which went toward groups with any immediate connection to wildlife - including $5,000 to a local exotic animal petting zoo.